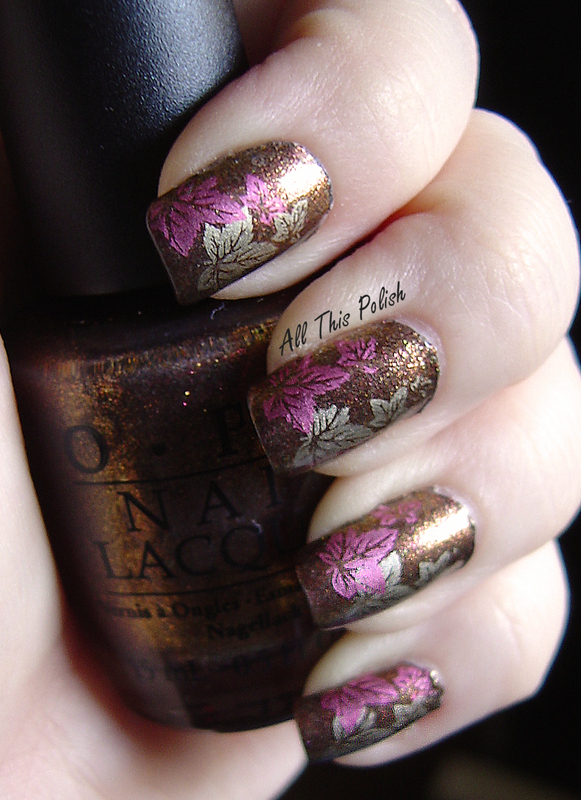 Just a simple manicure this weekend using two OPI colors. I originally had something completely different in mind when I started but it just wasn't working out the way I wanted. I started with 3 coats of OPI Rumple's Wiggin', which is a soft lilac from the Shrek Forever After Collection. Then I hit a wall. I originally had a dotted design planned out with this color as the base, but I couldn't get dots as big as I needed them to be. I'm not even sure if anyone actually makes dotting tools as large as I needed, but I've seen a bunch of do-it-yourself large dotting tools online using eyeliner caps and other common objects. I just need to spend more time making and testing some to find one that actually works well for me. I don't know if it was the curve of the items I tried or how high of an arch my nails have, but everything I tried kept resulting in extremely oval shaped dots, rather than circular dots. So I decided to put that original design idea on the back burner until I can perfect a large dotting tool. Since that idea was scrapped, I was stumped as to what to do next. 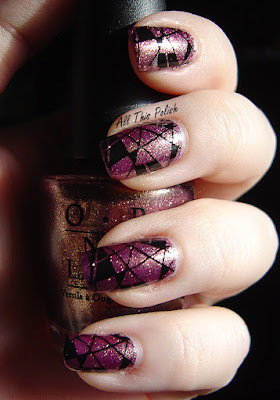 I already had 3 coats of Rumple's Wiggin' on so I decided to just keep it simple and I reached for my OPI Super Bass Shatter from the Nicki Minaj Collection, which I had yet to try. 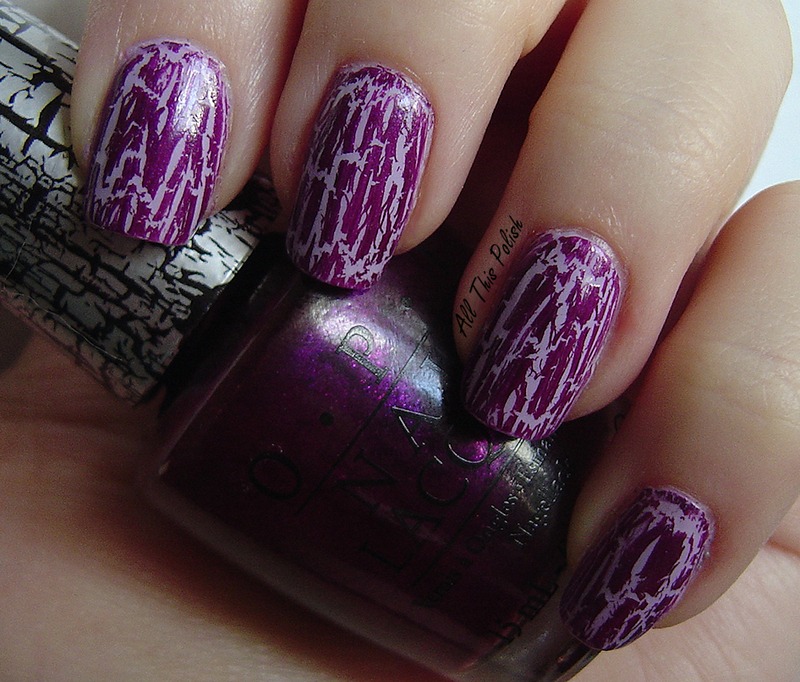 And this was the first time I did a base color and a shatter/crackle color that were from the same color family, rather than going with bases and shatters/crackles that are completely opposite or that are complimentary but still different color families. Really simple, but I do really like the way it came out. I can't say that I'm sick of shatter/crackle polishes yet. For as many as I have, I hardly ever use them so that is probably the only reason why I'm not sick of them yet. I don't think I'll keep this on all week though. I imagine that I'm going to get bored with it after another day or two. 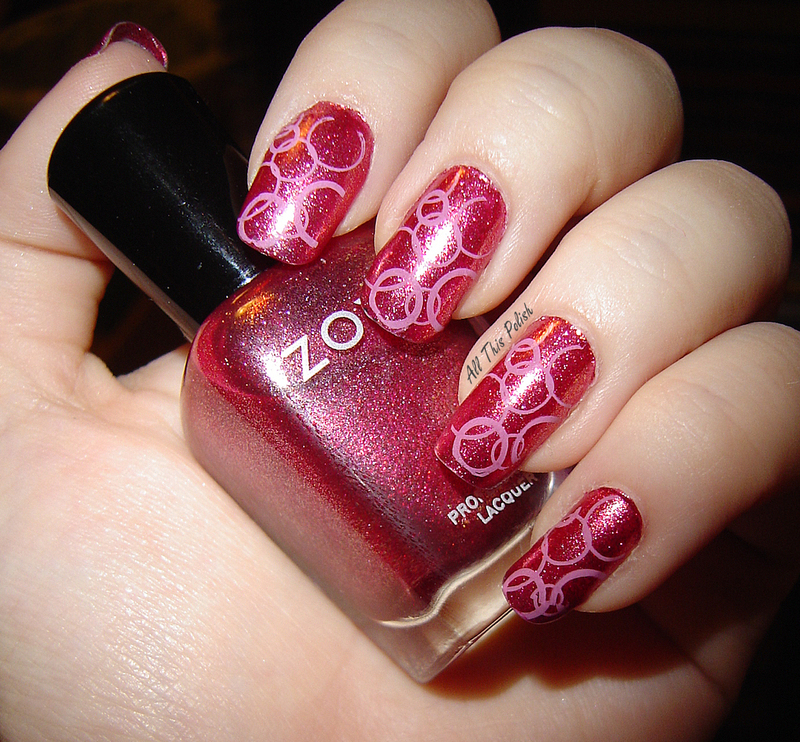 Zoya recently ran a Valentine's Day promo where you could get a free red polish plus free shipping with any purchase. I originally was going to pass on the promo but then on the 15th I found out that the promo was still running until midnight that night, not just on Valentine's Day. So then I basically proceeded to talk myself into it! I ordered Bevin and Skylar, both from the new True Collection. I also picked up Lolly. I already have Phoebe and Mitzi, so I wanted to get Lolly to complete the Mod Mattes Collection. For the free red polish, I went with Kym from the Wicked Collection. My order arrived this past Tuesday and I decided to try out Skylar first. It wasn't exactly how I had imagined it would look. I can't explain it. 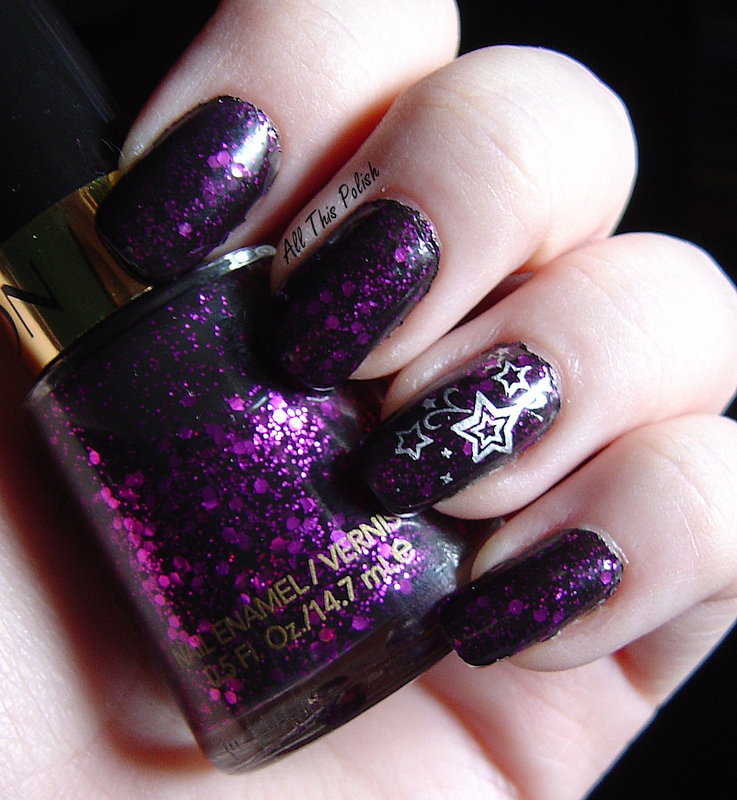 I would look at the bottle and love it, but I kept looking at it on my nails and was feeling indifferent. I wore it by itself all day Wednesday and it did definitely grow on me. 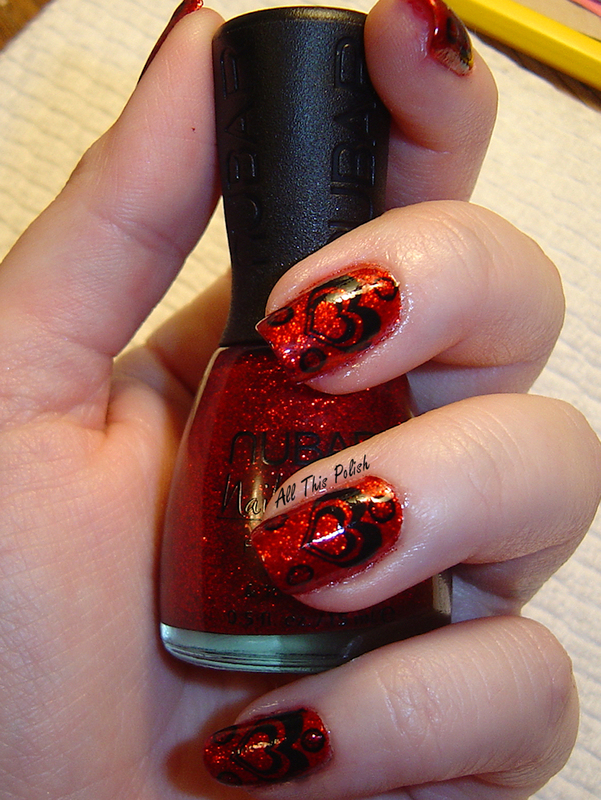 But by Wednesday night I wanted to switch it up and decided to try out another design from my Red Angel plates. I picked a retro looking design from Red Angel plate RA-108. 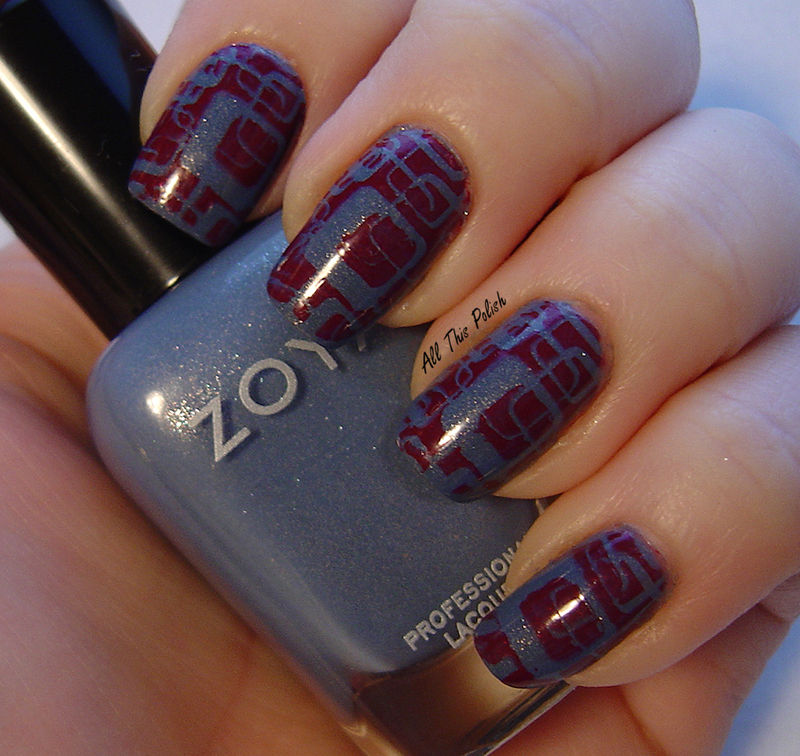 I stamped it onto Skylar using Konad Special Polish in dark red. Over Skylar, the dark red Konad polish came out looking more like purple but I really liked the way it looked paired with Skylar. 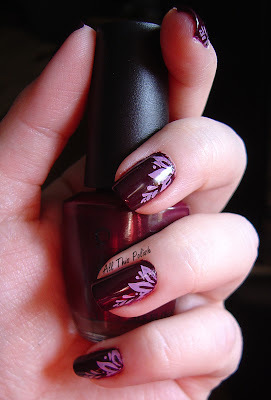 I had originally been trying to decide between the dark red and the dark purple Konad polishes, but I think the dark red was the better choice. I think the dark purple would have been too dark and not have complimented Skylar as well as the dark red did. I'm not sure what I'm going to do with my nails next. There is a great stamping contest going on that Enamel Girl just announced this past Wednesday. 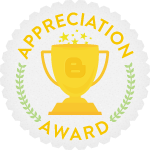 I definitely want to come up with something to submit, but the last day to enter the contest is not until March 21st, so I've still got some time to work on ideas for that. I'll probably just end up doing what I usually do on the weekend...open a random drawer of polish, reach in and try to find a color I haven't worn yet and see what I can come up with! Today, I have on Zoya Evvie. 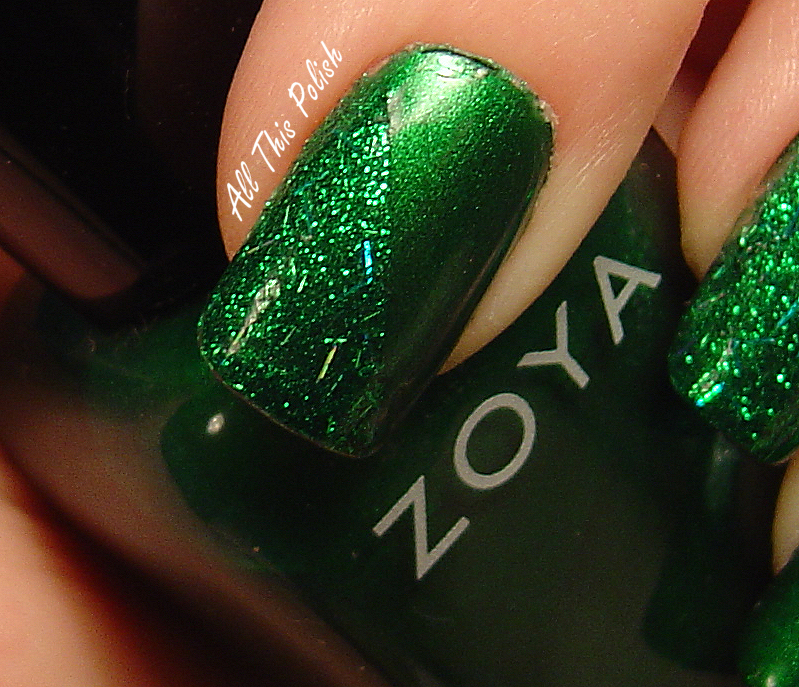 Zoya describes it on their site as "a rich, decadent, smoky, eucalyptus cream." I describe it simply as awesome. 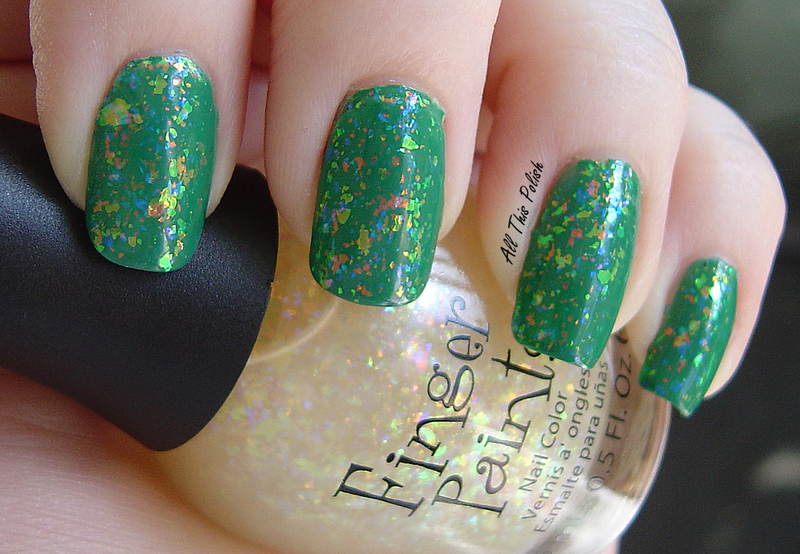 I love all different shades of green and this is no exception. 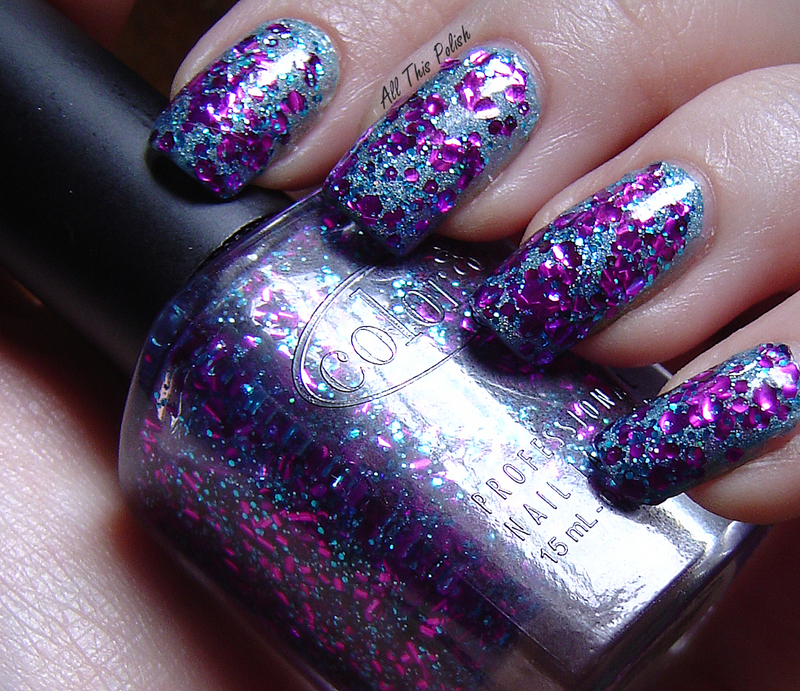 Zoya Evvie is part of the limited edition Zoya - Peter Som Color Box from New York Fashion Week 2012. 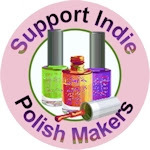 Zoya, along with several other polish brands, is pretty active during fashion week, working with different designers to create nail looks to compliment their clothing collections. 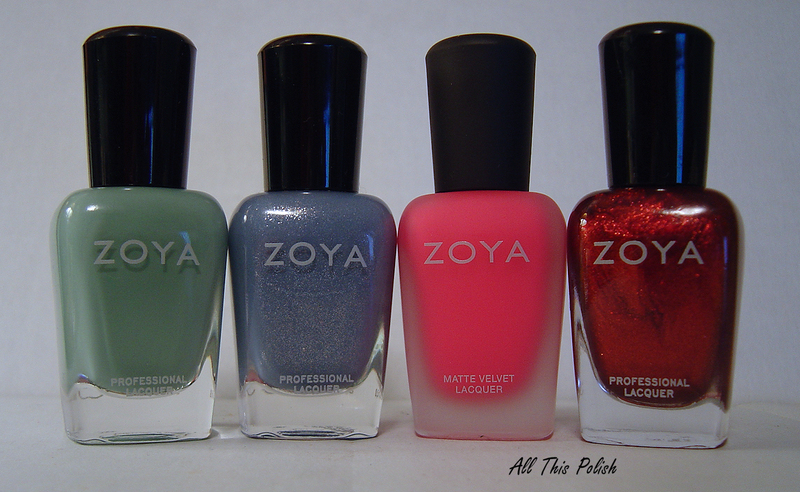 Most designers utilizing Zoya picked existing colors from the Zoya line. But two designers, Peter Som and Bibhu Mohapatra, actually worked with Zoya to create brand new colors to be used during their shows. The Peter Som collection was announced for sale on February 10th and I jumped on it. 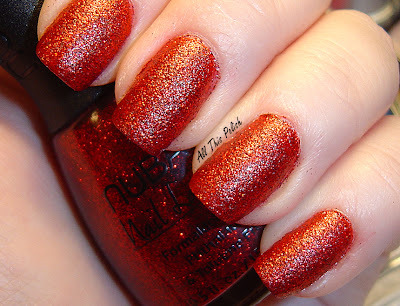 I usually don't buy polish without having either seen it in person first or having searched online for as many swatches as I can find. But swatches of the colors didn't exist yet online, so I'm not sure if it was the whole "limited edition" part of it or that they were offering free shipping, but as soon as I saw the announcement on Zoya's Twitter feed and saw the bottle pictures on Zoya's site, I placed my order. And having received the set yesterday, I'm so glad I did. Besides Evvie, the Peter Som Color Box includes a pale pink cream called Audrey and a plum "nail gloss" called Katherine. Katherine is a sheer gloss with "double the shine" that is meant to be worn either as a single coat or can be worn in multiple coats to build the intensity. Adding a clear topcoat is supposed to create a gel like look. In a video Zoya posted from the Peter Som show itself, their nail techs suggested that it can also be layered over other softer colors to give them an updated, fall look. 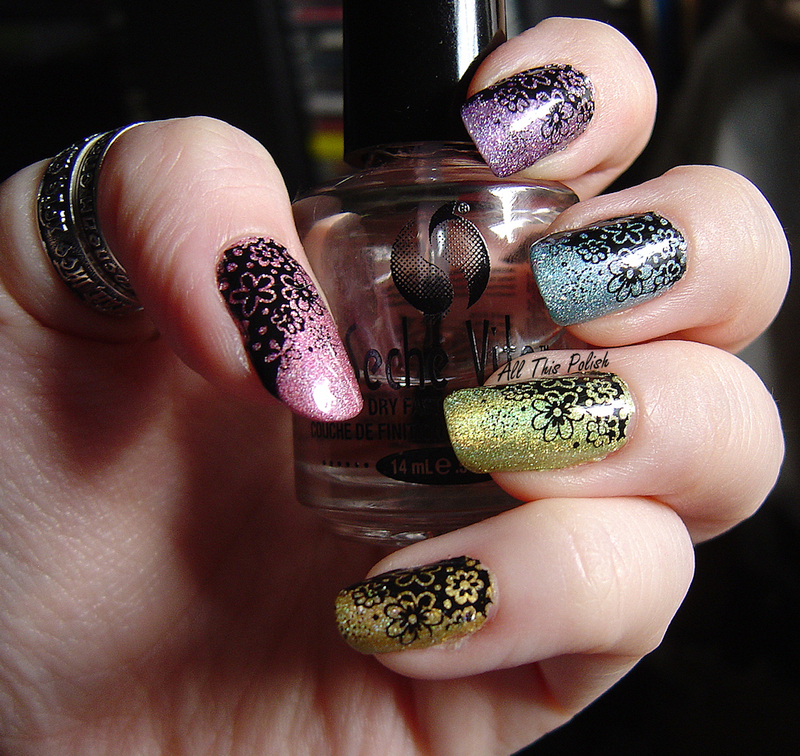 I decided to swatch the colors on a nail wheel and then experiment with layering Katherine over them. Evvie is not exactly a "soft shade" like Zoya suggests to layer Katherine over, but since it's part of the set, I figured I'd try it and not just swatch Katherine over Audrey alone. Overall, I'm very happy I decided to purchase this collection. It sold out completely in about 3 days. I did not purchase the other limited edition color box that followed, which was the Bibhu Mohapatra Color Box. The colors in the Bibhu Mohapatra box just did not interest me much. I'll be curious to see swatches of those colors though, once they start popping up online. As of right now, both color boxes are listed on Zoya.com, but marked as Sold Out. I could have sworn that I saw dates listed for restock when I checked the site Thursday, but as of Friday the dates were gone and replaced with the Sold Out message again. 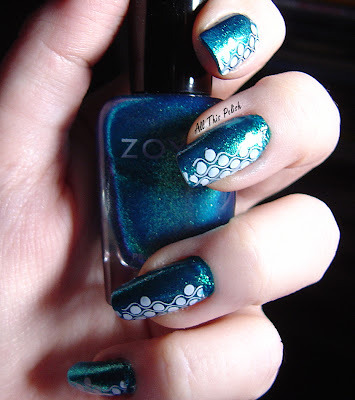 So I guess we'll just have to wait and see if Zoya decides to make these available again or not. This is my main Valentine manicure for 2012. I did this a few days ago, on the weekend, which is when I usually do most of my manicures. And...drum roll please...I remembered to take pictures in between each step this time! 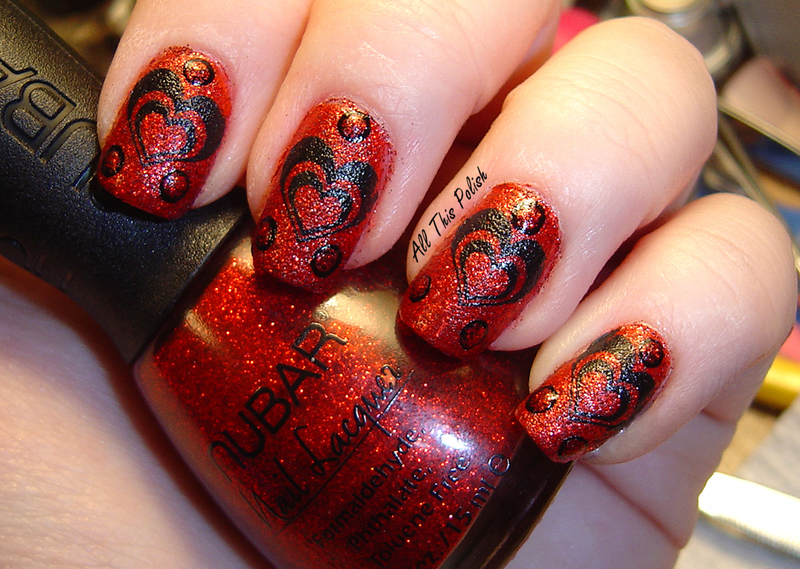 I started with 3 coats of Nubar Fire Sparkle. 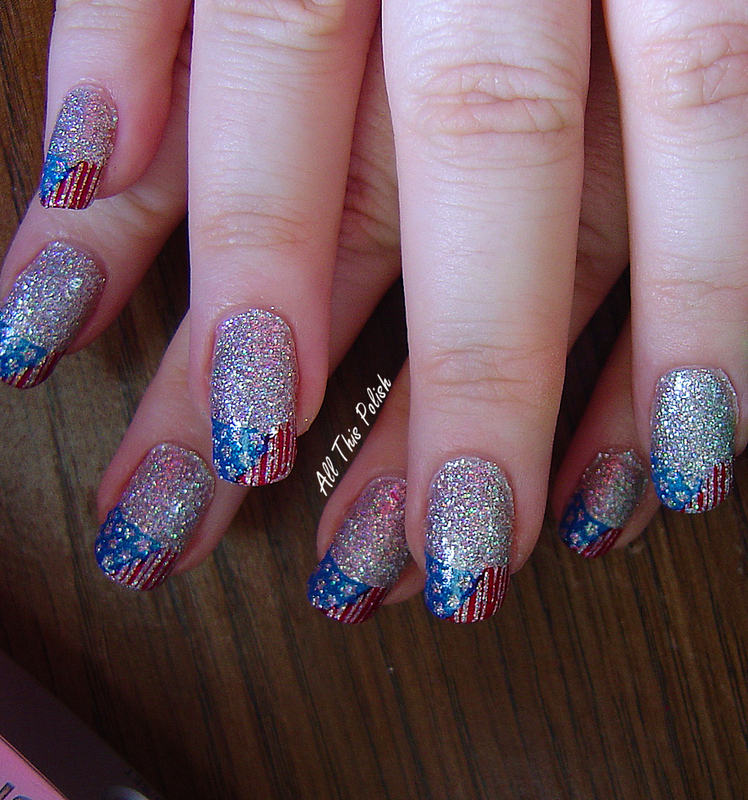 Pardon the glitter around my cuticles...I had to do a little bit of clean up around the nails and it didn't seem like much glitter was left behind until I started to edit the pictures. Fire Sparkle dries with a slightly rough finish, as you can tell from the picture. 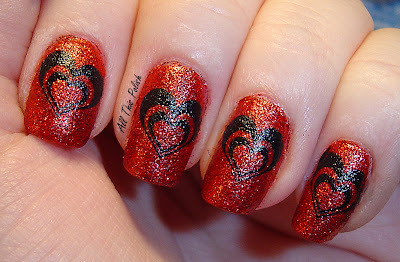 After the last coat was dry, I stamped on a double heart pattern from Red Angel plate 110, using Konad Special Polish in black. 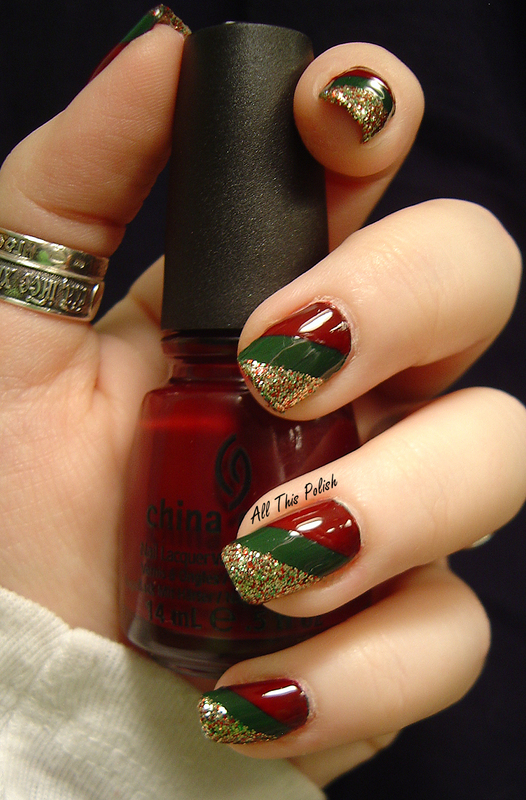 I didn't get them perfectly centered on each nail but in the final result, you really don't notice it at all. Once I had the heart pattern stamped, I felt like there was something missing. So I decided to put a few black dots around the hearts, just using Wet n Wild Black Creme and one of my dotting tools. Then going back to Nubar Fire Sparkle and using a smaller dotting tool, I put smaller red dots within the black dots. 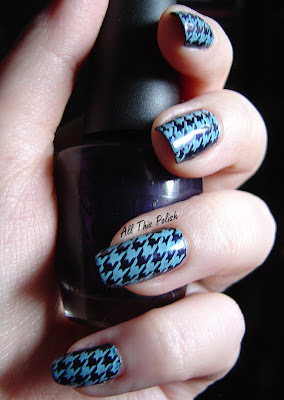 Then I applied Seche Vite top coat to finish. 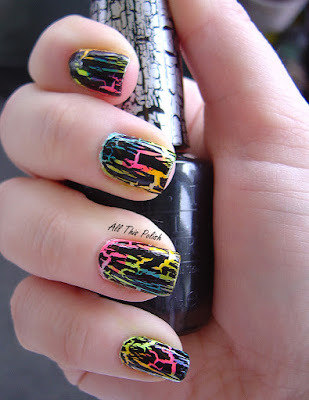 I actually used two coats of Seche Vite on this. As the first coat was starting to dry, I could see a bit of the roughness from the glitter starting to reappear. But the second coat took care of that. 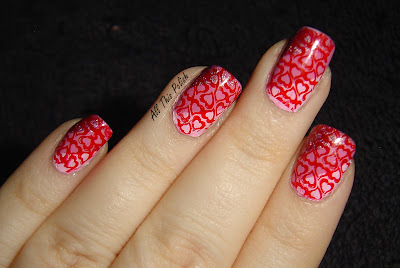 This past week, I've been wearing a pink manicure with red hearts as my first Valentine design of 2012. It was more or less done on the fly. I had a Valentine idea I wanted to do but I wanted to save it for Valentine's Day itself, which left me feeling unsure of what I should to do for the week before Valentine's Day. 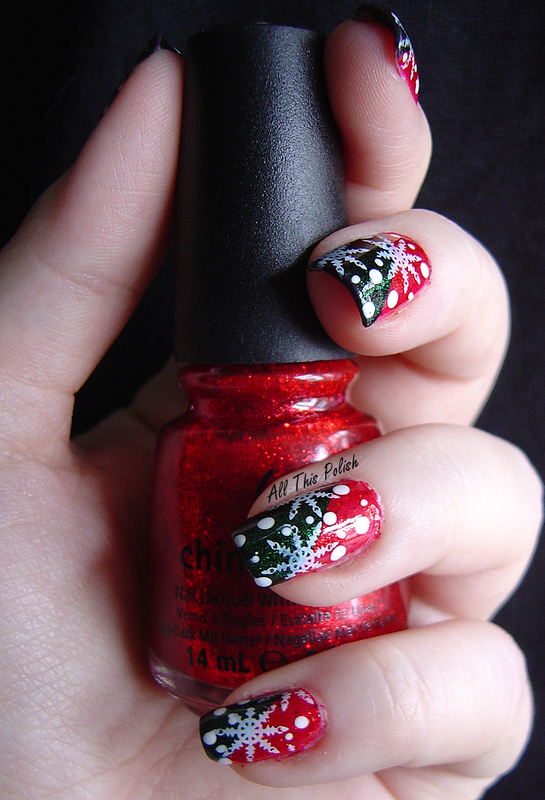 So it kind of evolved as I was painting my nails, without a real clear picture in my mind of what I would end up with. Since I planned to focus on red for the week of Valentine's Day, I decided to go with a bunch of pink shades for the week before. 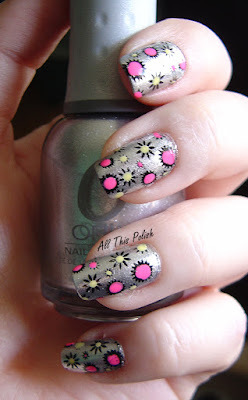 I started with a few coats of OPI Mod About You. Then I taped off part of my nails at an angle and used a coat of OPI Sparrow Me the Drama, taped them off again and made a third stripe with Milani Digital. 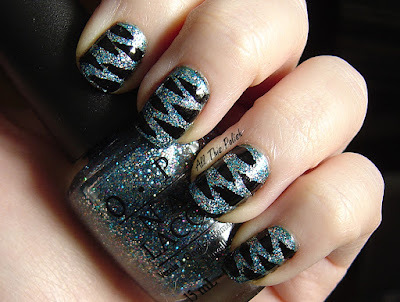 Even though I read a ton of blogs, I'm not used to doing my nails with the intent of posting it online, so I completely forgot to consider taking pictures of my striped nails prior to stamping. I'll have to remember from now on to take pictures in between steps. 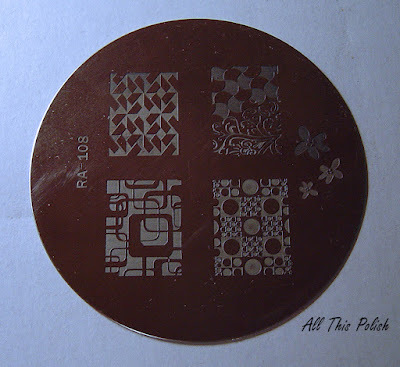 While everything was drying, I sifted through my stamping plates trying to decide what I was going to use on top. I finally settled on a tiled hearts pattern from Red Angel plate 114 and used Konad Special Polish in red. 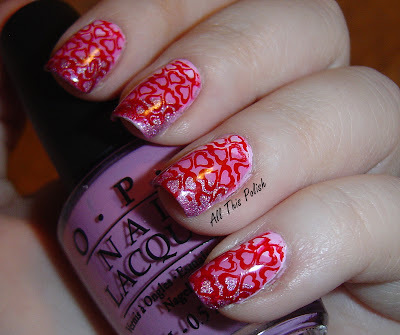 I just recently bought the Red Angel plates off of Amazon after seeing them on Enamel Girl's blog, so I was looking for a chance to use them again. 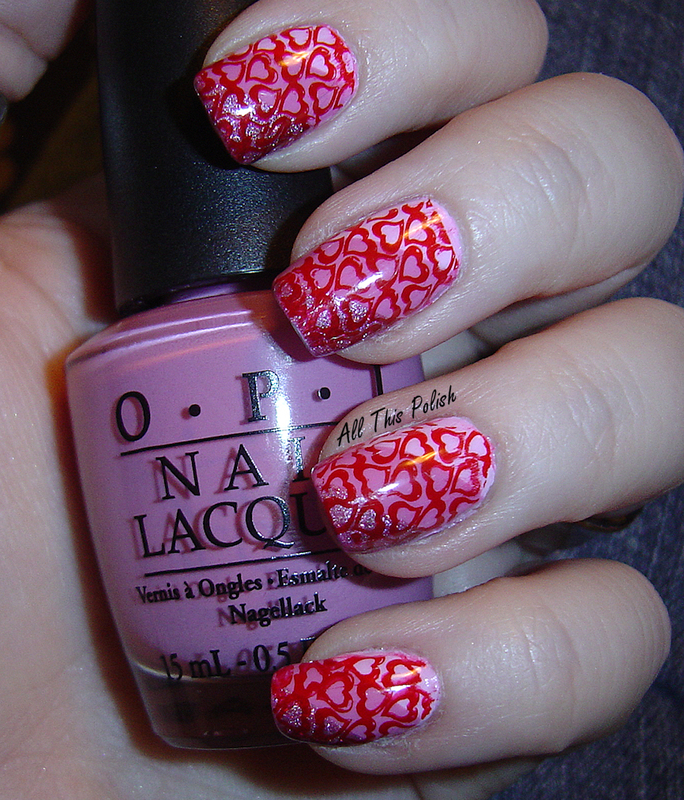 It wasn't my best attempt at stamping though. 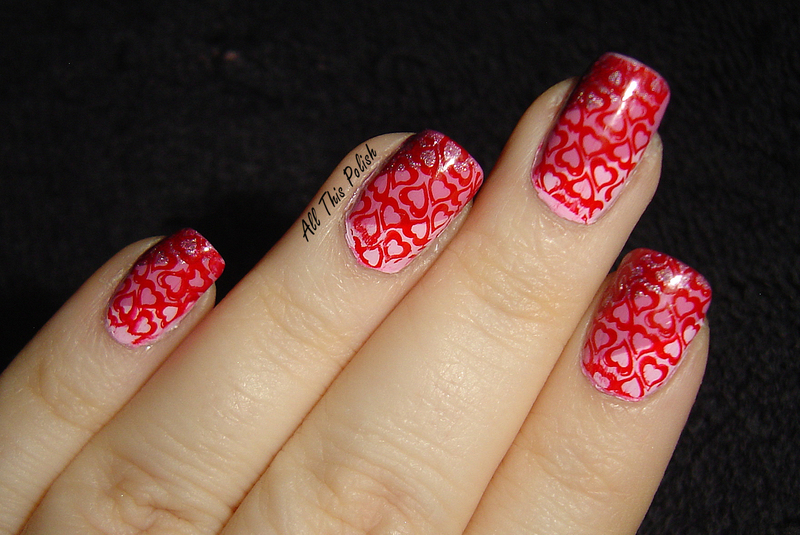 I usually don't have issues with the full nail patterns but this time I think that I end up pushing too hard when I was rolling the stamper. I didn't even realize there was a pretty badly blurred spot, right on the tip of my left hand middle finger, until I was browsing through my pictures. 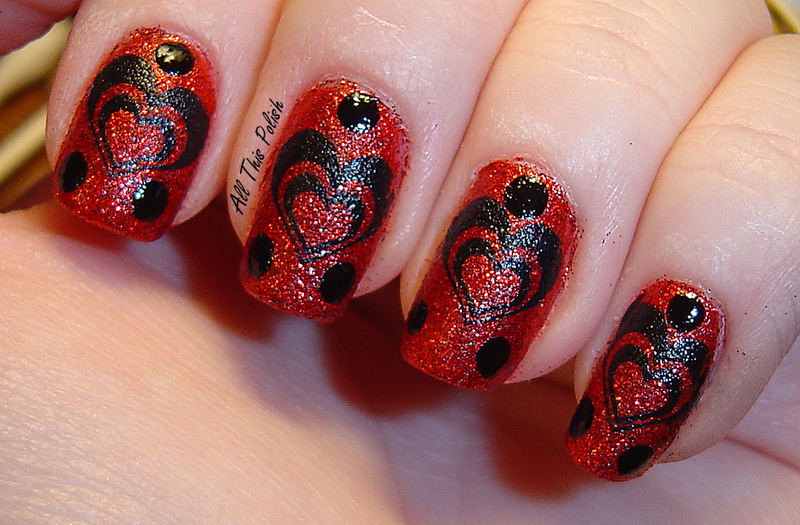 I also think that this design ending up looking better from a distance rather than close up. Overall though, I was pretty happy with the way it turned out. 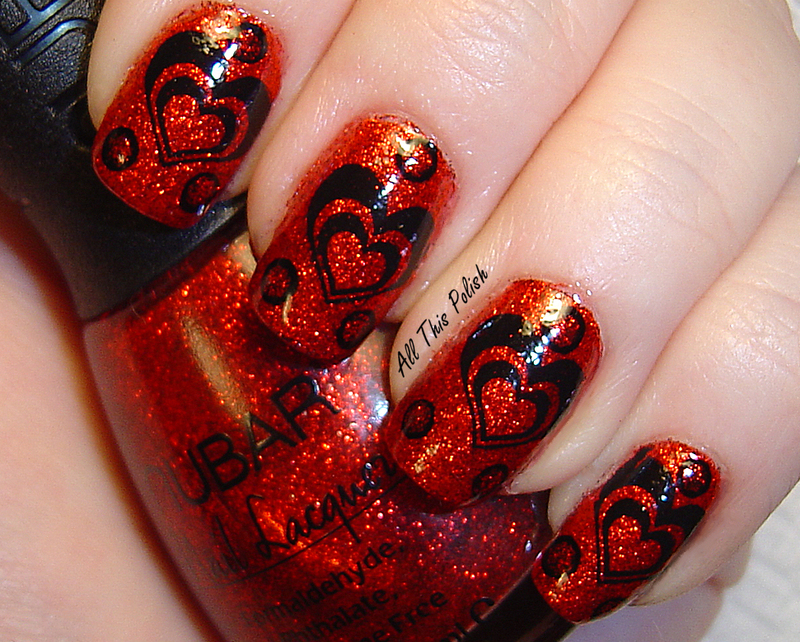 I'll be working my my next Valentine manicure this weekend, so I hope to have that up sometime during the week. 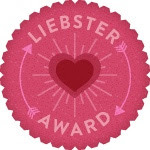 I also received my February Birchbox a few days ago, so I might take some pictures of what samples I received this month and do a post on that sometime this week as well. 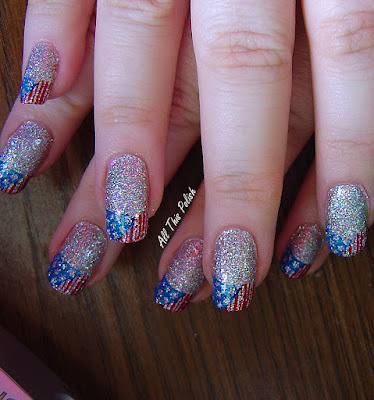 I've been thinking, for the past several months, of starting my own blog about polish. I follow a ton of other blogs and love reading people's opinions, seeing their pictures and getting inspiration from their ideas. 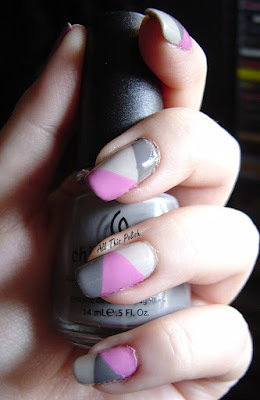 I started to want my own outlet to share my manicure ideas and opinions. Especially in a larger space than what commenting on other people's blogs will allow. I did have some hesitations though...what if no one reads it, what if someone actually does read it, does anyone really need another polish blog out there, my pictures aren't that great, blah blah blah...but really the hardest thing was coming up with a stupid name! 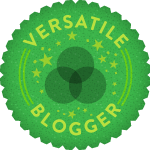 There are some awesome blogs out there and some very clever names. Often, when I would think of a name to use, a quick Google search would turn up a blog already using it. The name I decided on finally came to me one Saturday night when I was in my kitchen watching TV, waiting on the pizza I was cooking in the oven. 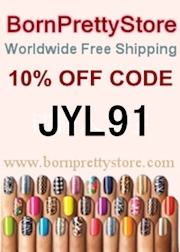 I was feeling a bit overwhelmed by the crazy amount of polish I had bought in the past few months and how I have so much that it makes it hard to choose what to use each week when I do a new manicure. 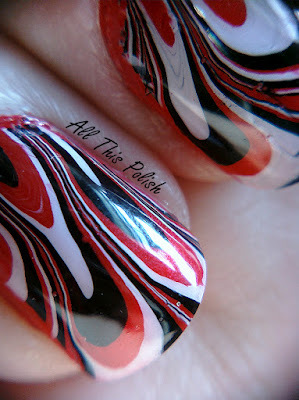 Finally I was just thought, "What to do with all this polish! Hmmm, all this polish. I kinda like that." 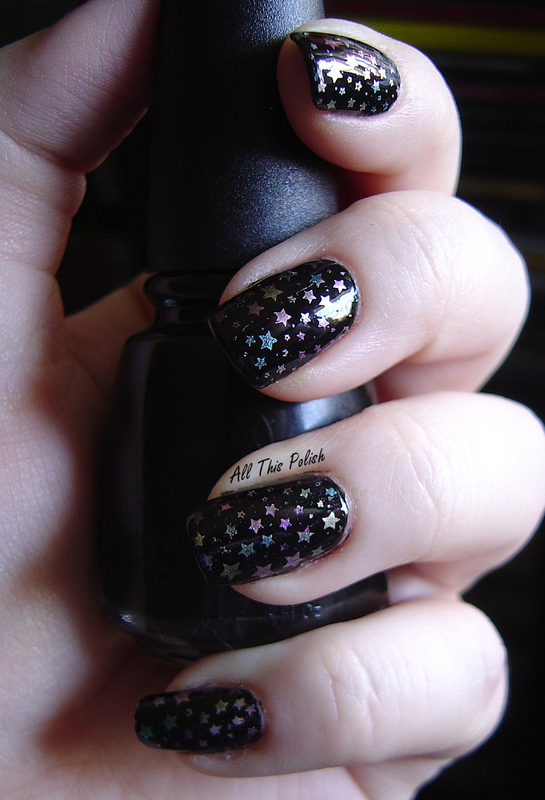 Once the name, All This Polish, was decided on, it was time to get a general design put together and get past my initial fears of putting my opinions and my attempts at nail art out there for the entire internet to see. I imagine that eventually I'll go into some more detail about my obsession with polish and how it came to be. But for now, I'm just going to post some pictures I have of some of my manicures that I have done in the past several months. Most of these are from 2011. 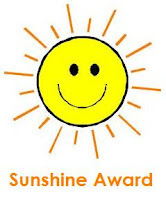 You may have seen some of these pictures online at the Facebook page for My Simple Little Pleasures. 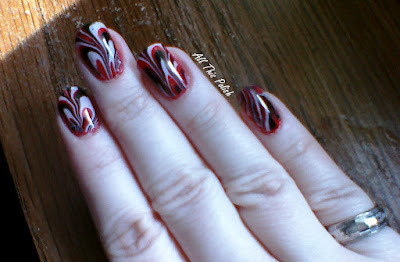 Colette's blog is one of the first polish blogs I started reading and her water marble tutorials on YouTube really helped fuel the obsession I now have with nail polish. Her Facebook page for her blog is one of the few places I ever got up enough nerve to post my designs. 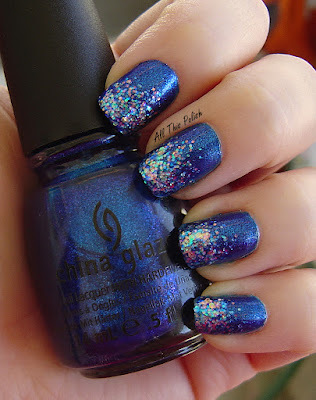 The others are mostly Facebook pages as well, such as Zoya's Facebook page, China Glaze's Facebook page and I also have an account in the Nail Art Gallery on the NAILS Magazine web site. So, pardon my pictures as some of them aren't the greatest quality. I really need to get a new digital camera. I currently have a Sony, which I bought back when my cat was just a kitten and she will be 9 this coming May! For a self-proclaimed gadget geek, it's pretty sad that I haven't bought a new camera in almost a decade. I'm also learning new tricks and experimenting to get better results but most of these pictures are from before I started messing with settings and lighting. Also, pardon my experimentation with my watermark. It seems like a good idea to watermark my pictures but I'm still playing around with how exactly I want it to look. Opinions and tips are welcome! These are posted in the order I did them, starting with my first water marble and then my first attempt at Konad stamping, both of which I did in May 2011. 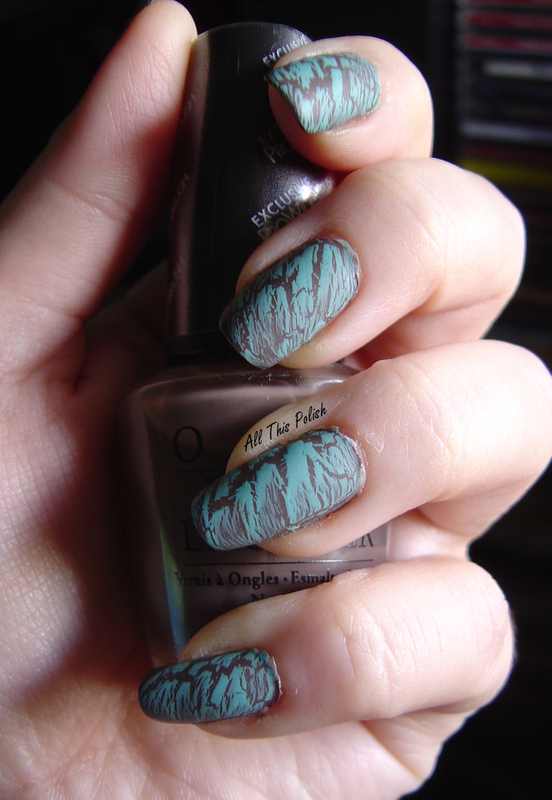 Crappy cell phone pic of my first ever water marble. Cell phone macro (special lens attachment) of water marble. of my first ever Konad. to try the idea as I saw it in my head. Well, there you have it, my first post. This whole thing will be a work in progress. I have some experience with image editing and HTML/web site design so it should be fun to get back into that a little bit. I'm sure I'll eventually try changing colors and settings, add on some tabs and some more links and all the bells and whistles. But for now, I'm satisfied with my initial entry into this brand new world.